﻿ Nonprofit Fundraising, Part 3: How to Get Sponsors for Your Event » Red Mango Marketing! This post is the last in a three-part nonprofit fundraising series. Get more tips during our FREE webinar: How to Communicate with Supporters Before, During, and After a Fundraising Event with nonprofit expert, John Haydon. In part one of this nonprofit fundraising event series, we talked about all the things you should be thinking about as you plan your event. In part two, we covered getting your save the date ready, setting up your event registration, and creating a plan for ongoing promotion. Today, let’s take a closer look at reaching out to sponsors. What is an event sponsor? A sponsor is any person or company that provides something free (money, services, products) to increase the value of your event. Sponsors are key to your event because they add incentives that will draw people to your event. Why are sponsors important to the success of your fundraiser? In addition to the value they add to your event, sponsors also provide a marketing and promotional benefit. For example, if a local restaurant is providing food for your event, they should also advertise your event at their place of business. Fundraisers and sponsorship opportunities are great business partnerships. Most companies, especially larger local businesses have a budget to do this every year. So the earlier you start mining for free stuff like goodie bags and food donations the better. Get creative about who you reach out to and remember that anything that adds value to your event is worth it. When should you reach out to potential sponsors? Usually about four months out. Plan ahead so that sponsors have enough time to go through any necessary approvals. You also want to avoid competing with other local organizations for sponsors. The earlier you can start mining for sponsors the better off you are. Who can you get to sponsor your event? The short answer is anyone and everyone. Start with local businesses and ask your registrants if their companies want to get involved. Reach out to local restaurants for gift cards or food donations as well. Make sure you ask friends, colleagues and then have them ask their networks and so on. How can you get sponsors to say yes? Getting sponsors can be stressful, especially when things don’t happen as quickly as you like. Remember to have fun, be creative, and target places you personally enjoy being a part of. If you’re a loyal customer of a local business, they will be more likely to support you. One key to getting a “yes” is to think of creative ways to reach out to potential donors. This helps you stand out from the other organizations that are requesting sponsorships. First contact is always important so don’t just send a generic email to all the “info@” email address you find on websites. Dive in deeper and take a personal approach to making contact. Visit a favorite local store that you support and ask if they donate or sponsor local events. Try to visit a business during off hours so they can give you their full attention. Make sure you reach out early and often. And don’t get disappointed if things don’t happen as fast as you’d like. Just give yourself plenty of time to accomplish your sponsorship goals. Set up a timeline and make a list, off the top of your head, of places you would like to reach out to. Then, start reaching out. Search your local area for similar events and see what others are doing. This will help generate ideas for the types of sponsors you want and give you ideas of how other events are run. Looking for more fundraising tips? Join us for a FREE webinar: How to Communicate with Supporters Before, During, and After a Fundraising Event with nonprofit expert, John Haydon. Can’t attend live? Register anyway and we’ll send you a recording! 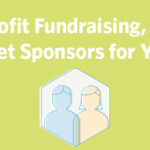 The post Nonprofit Fundraising, Part 3: How to Get Sponsors for Your Event appeared first on Constant Contact Blogs. This entry was posted on Wednesday, May 17th, 2017 at 9:00 am	and is filed under Event Marketing, Featured, News & Updates, Nonprofit. You can follow any responses to this entry through the RSS 2.0 feed. Both comments and pings are currently closed.